‘BIPS’ refers to Bangladesh, India, Pakistan and Sri Lanka – the most populous countries in South Asia. ‘Games’ refers to the Commonwealth Games, the last of which concluded on the weekend in Glasgow. ‘Puzzles’ refers to the intriguing questions revealed by the Games about BIPS. The specific puzzle we explore in this post is why the performance of Indian women is so much better than that of the other countries when the human development indicators of India are fairly similar to Bangladesh and Pakistan and actually much worse than those of Sri Lanka. 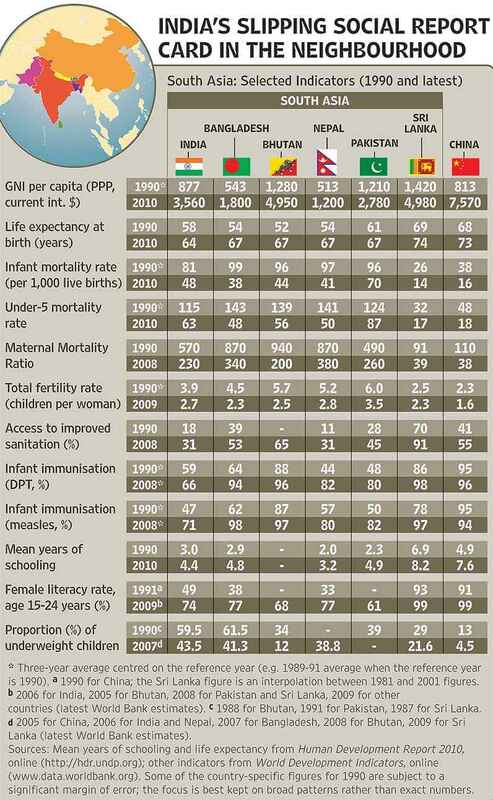 For the sake of reference, the human development indicators as presented by Jean Dreze Amartya Sen are shown in the following table. At one level this post is a straightforward update of two earlier posts that had crafted a narrative from the results of the Commonwealth games up to 2010. The first, Pakistan: Falling Off a Cliff, contrasted the steadily improving performance by India with the steady deterioration by Pakistan. The second, The Rise of Indian Women?, highlighted the remarkable improvement by Indian women in comparison with Indian men. The updated tables are presented below. 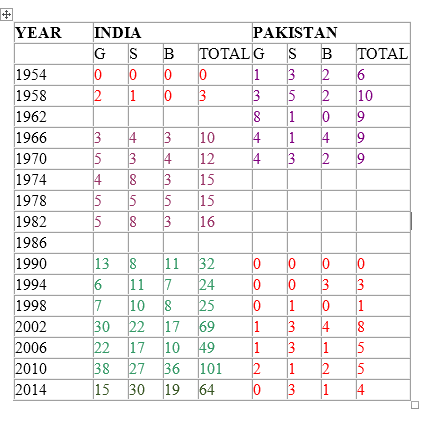 The first table shows that while Pakistan’s performance continues to be stagnant, the Indian medal tally is also down sharply from 101 in 2010 to 64 in 2014. This needs to be explored further. My own guess is that this is an artifact of the specific games that are added and dropped in each version of the event. A true indicator of performance should focus only on those core games that remain constant across the years, for example, athletics and boxing. The second table shows that the relative performance of Indian women continues to improve and by 2014 they have achieved virtual parity with the men. Starting from zero in 1990, Indian women secured close to half (45%) of the total medals won by the Indian contingent. This continues to be relevant but the question still remains why women from the other three countries are so completely missing from the picture. Of course, one should normalize for the variation in population, but as the medals table for the Glasgow Games shows, population is not a completely determining variable – Jamaica with a population less that 3 million has a total of 22 medals with women winning more of them (13) then the men (9). This then is the puzzle: Why are Indian women forging ahead so much faster than women in the other South Asian countries? In dealing with a problem, or a phenomenon in general, three steps are essential: identification, explanation, and prediction. Central to all three are the facts or the data that are employed in the analysis. It is the data that often proves to be the most problematic part of the process and confounds identification, enables misdiagnosis, and generates poor prognosis. And that, I will explain later, is why I care about games. At the conclusion of the 2006 Asian Games I had written an article (Pakistan: A Downward Spiral) using performance in sports as an objective indicator of the structural changes that could have been taking place over the years in China, India, and Pakistan, respectively. The indicator pointed to a stunning improvement in China, an upward trend in India after a period of stagnation, and a steep decline in Pakistan. Can you tell me what is meant by ‘sublimated violence’? I am asking this question to try to answer another that was put to me yesterday. It has left me quite perplexed. A reader wrote and described the following observation. He was attending a serious talk by an American professional. Somewhere in the middle of the talk, the presenter had occasion to mention he was from Pittsburg. All of a sudden, he swiveled from his hip, pumped up his fist, and shouted ‘Go Steelers.’ And then he continued with his serious presentation. This essay was written after the last Asian Games in December 2006. When it was first submitted for publication the editors returned it as too pessimistic. Pakistan was at the time in its ‘enlightened’ phase and clocking high rates of economic growth – the writing on the wall was there even then but people wished not to see it. Many complained that the essay had simplified complex issues by using a trivial indicator of development. It was finally published in Chowk on July 30, 2007 with a sign of interrogation at the end of the title. Now that the lights have gone out and the country is bankrupt, we can take out the interrogation sign and finally face up to the reality. Hiding our heads in the sand is not going to get us anywhere. With a major election coming up, we are likely to hear a lot about the problems facing Pakistan, their origins and solutions, and the importance of democracy or good governance for the future. Many of these descriptions and arguments would be what we have heard many times before and many of the prescriptions would be like old wine in new bottles. We seem to be going round and round in circles. Given the realities, going round and round in circles could be an enviable state of affairs. More and more people are becoming convinced that in tandem with going round and round in circles the country is also moving backwards in many ways. In other words, Pakistan is in a downward spiral. There are people who argue that Pakistan has been in a downward spiral from day one. The realization that this may indeed be true struck me with some force when, in 1997, I thought about writing an essay on the golden years of Pakistan to mark fifty years of Independence. I had to concede, much against my will, that there really had been none and I dropped the idea. Did Pakistan peak with its creation? Was that its greatest moment of glory, although an event marked by about a million lost lives can hardly be considered in such a one-dimensional perspective? Even so, has there really been a golden age since then? What can we use as evidence? A full third of the population still living below the poverty line sixty years after the event that was supposed to change our fortunes? Half the population still illiterate? People dying of contaminated water in the twenty-first century? People killing each other in their places of worship? These are devastating indicators but they are all subject to disputation, to alternative interpretations of bad data, to manipulation of the data itself. What else can we produce as evidence? A short while after I gave up writing the essay on the golden years of Pakistan, I came across Intizar Hussain’s book Chiraghon ka Dhuan. The book is ostensibly about the fifty year history of Pakistani literature but it can profitably be read as the fifty year history of Pakistan itself. And what a story of decline it is. From a point where waiters in the Pak Tea House could hold their own in literary discussions to the point where writers were conversing in the language commonly associated with waiters. This is only a slight exaggeration. The book must be read to get a true sense of the cultural decline that has marked the journey of Pakistan. And cultural decay is a very powerful indicator of a more general decline. And yet, some might argue that culture is luxury of the elites and what really matters is that everyone has a cell phone now. That’s all to the good, but cell phones did not exist sixty years ago and are therefore not a good indicator of progress. The luxuries of one era become the necessities of another and such transitions often hide more complexities than they reveal. A lot more people also consume bottled water today but that can hardly be used as a measure of progress. Let me refer to a measure about which there can be no disputation, which is spelled out in black and white for all to see for their own selves. Let me use Pakistan’s performance in the Asian Games as an indicator of how much and how well the country has invested in the health, education, training and welfare of its citizens. After all, a country’s investments in these areas should show up in its output and performance, shouldn’t it? Well, let us start at the beginning. The first time Pakistan participated in the Asian Games was in 1954 and it was fourth in the ranking with a tally of four gold and five silver medals. One would expect that a new country, getting its act together, would build on the promise of its early years. If you thought so, be ready to be surprised. This was the highest ranking ever achieved by Pakistan in the Asian Games competitions; it was fifth in 1958, sixth in 1962, eleventh in 1966 and thirteenth in 1970. Talk about a continued decline. Between 1974 and 1990, the performance picked up in terms of ranking going from eleventh in 1974 to sixth in 1990 although the number of gold medals did not exceed the four won in 1954. 1994 marked a falling off the cliff; the ranking plummeted to twenty- two and the number of gold medals to zero. In the recently concluded games in 2006, both the ranking (thirty-one) and the tally of medals (four) reached their lowest levels ever. Of the four medals, there were no golds, the lone silver was in kabaddi in which four teams participated, one bronze was shared and another was in a sport called Wushu. From fourth in 1954 to thirty first in 2006: does that convince anyone there has been a decline? Let us look at the comparators. India was fifth in 1954 with four golds and four silvers. It lost ground but not much; its ranking in 2006 was eight while the number of golds and silvers were up to ten and seventeen, respectively. But now let us get a sense of what real progress, a real golden age, looks like. China, which had a new beginning in 1949, two years after Pakistan, participated in the Asian Games for the first time in 1974 ranking third with 32 golds and 44 silvers. It climbed to second in 1978 (51 golds, 55 silvers) and first in 1982 (61 golds, 51 silvers). Since then China has never lost the top ranking: in 2006 it had 165 golds and 88 silvers against its name. That’s as good a comparative picture as you can get: stunning progress, stagnation with a sign of a nascent pick up, and steep decline. And yet, no heads rolled in Pakistan in 2006 and no one resigned. There were the customary and habitual calls for an enquiry and a few lame excuses. The same old story as the country continued to slide. This is a sensitive subject, I know. Anyone arguing that Pakistan has been in a state of constant decline is considered un-Pakistani and advised to go where things are better. But that is not going to resolve Pakistan’s problems which are legion quite apart from whether there has been a decline or not. And the first step to resolving the problems is to understand them. One cannot go from a description of the symptoms to a prescription for the cure without securing a diagnosis. What ails Pakistan? Why is Pakistan beset by the problems it faces? We cannot afford to go round and round in circles without imploding at some point. This is the motivation for this introduction to a proposed series of essays. One can look at them as an attempt to try and debate the reasons underlying our various predicaments and to assess what those reasons imply for the remedies that are being proposed. There is no need for the reader to agree with the arguments. There is a need, however, to join the argument. Otherwise we are likely to continue to spiral downwards together. Since the time this essay was written, the Beijing Olympics have taken place. For the record, China won the highest number of golds (51) and India had three medals including its first ever gold in an individual sport. Pakistan had no medals whatsoever, behind war-torn Afghanistan which had one.